We offer a range of Electric Pipe Threading Machines that comprises three models, having different pipe capacities. The range is heavily favored by numerous organizations based in diverse industries, and successfully fulfilling their variegated requirements. We have emerged as a trustworthy manufacturer, exporter, importer, wholesaler and supplier of optimum quality Electric Pipe Threading Machine. The offered threading machine is designed using the best quality raw material and advanced technology in adherence with industry standards. Used for threading of electrical, water and gas pipes, quality experts test this threading machine against different quality parameters so as to maintain its quality. Moreover, our patrons can avail this threading machine in different dimensions and specifications at market leading price. Compact structure made of cast aluminium alloy light weight body, easy operation, good safety & low noise, referring to the international advanced technology suitable for threading requirement of pipe thread for BSPT & NPT on request. Profiling die head for standard taper pipe thread. Dependable clamping, fee from slip and deformation. 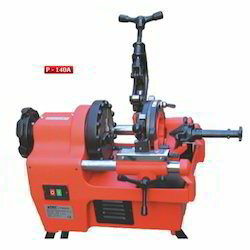 Looking for Electric Pipe Threading Machine ?